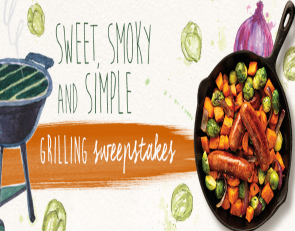 Al fresco “Sweet, Smoky and Simple” Grilling Sweepstakes – Win $500 & more! ENTER SWEEPSTAKES HERE – Alfresco Sweepstakes page. ENTRY LIMIT – Limit: One online entry per person or email address per 24 hour period. ELIGIBILITY – The “Sweet, Smoky and Simple” Grilling Sweepstakes is open to legal residents of the 50 United States and the District of Columbia (U.S.), age 21 or older at the time of entry. SWEEPSTAKES ENTRY PERIOD – Online entries must be received between 12:01 AM, Eastern Time (“ET”) Monday, June 20, 2016 and 12:01 AM, Eastern Time (“ET”) Monday, August 1, 2016. PRIZES – GRAND PRIZE: One (1) Grand Prize winner will receive one (1) check in the amount of $500.00 (1) grill of the Grand Prize winner’s choice from thehomedeopt.com valued up to $500, all taxes, fees and shipping included and one (1) year’s worth al fresco® product in the form of coupons for 16-FREE al fresco® product (any), maximum value of $6.99 per coupon, (total approx value $111.84). RUNNER UP PRIZE: One (1) Runner Up will receive one (1) year’s worth al fresco® product in the form of coupons for 16-FREE al fresco® product (any), maximum value of $6.99 per coupon, (total approx value $111.84).